In 2001, Walter and Leonore Annenberg established The Annenberg Foundation Trust at Sunnylands to “address serious issues facing the nation and the world community.” They envisioned Sunnylands as a place where intimate and solution-driven meetings could take place as they had while the couple were alive. 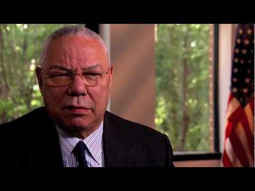 In the years after it was established, the Trust developed programs focusing on improving civics education, developed and disseminated information on the treatment of adolescent mental disorders, increased communication among and impact of Annenberg-funded organizations, and held retreats to improve the functioning of democratic institutions. 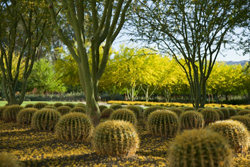 Prior to her death in 2009, Leonore Annenberg began to build a spectacular new 17,000-square-foot building and nine-acre garden that would provide additional space for retreats and meetings as well as a place for the public to learn of the historic significance of Sunnylands. A new addition to Sunnylands is the 17,000-square-foot Sunnylands Center. Free and open to the public Thursdays through Sundays, this new building is where visitors can learn more about Walter and Leonore Annenberg and their commitment to serving their country, to philanthropy, to education, and to the arts. The Center includes interactive educational kiosks, informational panels and videos, an orientation film in the theater, and selections of art from the Sunnylands Collection. Visitors can also enjoy and explore the 1.25 miles of garden paths that wind throughout Sunnylands Gardens. In November, a free one-hour guided garden walk that covers design, sustainability, and desert plants is offered every Friday at 9:15 a.m. In December, garden walks will be at 11:00 a.m. on Thursdays. No reservations are needed. 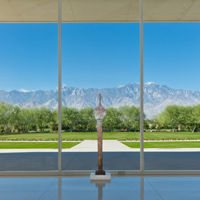 The west windows of Sunnylands Center present a magnificent vista of the 10,000-foot-plus San Jacinto Mountains looming above palo verde trees. Landscape architect James Burnett used Vincent van Gogh’s Olive Trees of 1889 as inspiration for this masterpiece view of the Center’s unique gardens. Burnett carefully crafted nine acres of desert, designing 1.25 miles of walking paths that meander through more than 53,000 individual plants and 50 arid-landscape species. The gardens were carefully conceived to appear different in every season with variations that create a memorable sensory experience. In the mid-1960s, Walter and Leonore Annenberg hired Los Angeles-based architect A. Quincy Jones (1913-1979) to create a midcentury modern residence in Rancho Mirage. Jones, who for many years was dean of the School of Architecture at the University of Southern California, was known both for designs that integrated houses into the landscape and for “statement roofs.” His signature style is evident at Sunnylands, where he used overhangs to shield the interiors from the direct sun, plus walls of glass to allow the climate’s brightness to fill the rooms. Leonore Annenberg’s deep love of flowers and nature is reflected in the cactus and rose gardens that abut the house and terrace. Interior rooms flow into each other with the same open expansiveness as the surrounding landscape.